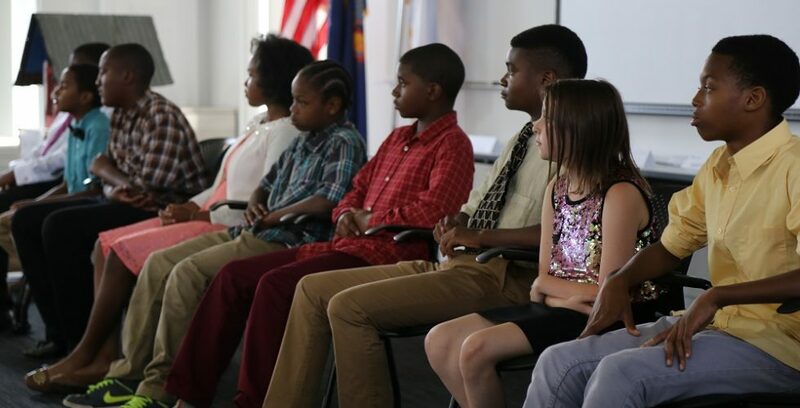 Camp participants at their final presentation in August. A mural maps Buffalo's Martin Luther King Jr. Park neighborhood. 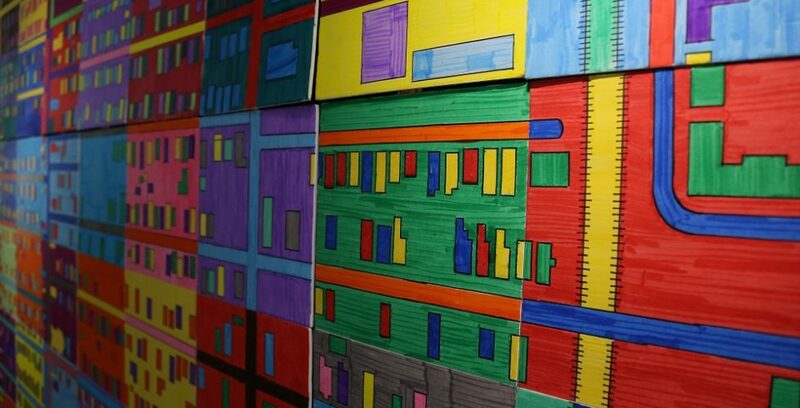 Students assembled the colorful grid of neighborhood streets and landmarks based on fieldwork and lessons in urban planning and design. 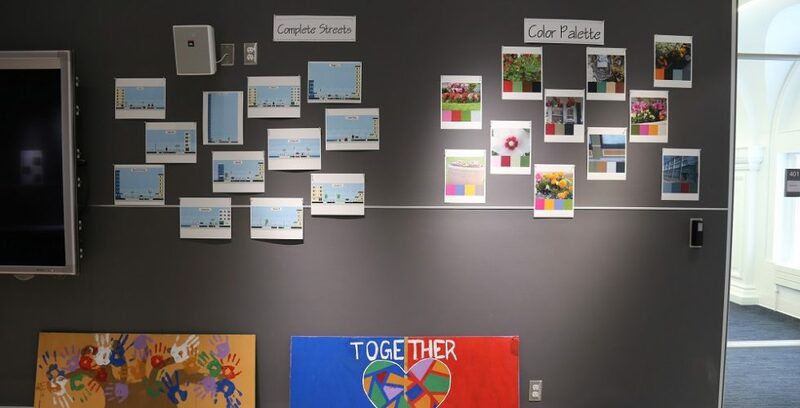 Students display samples of their research and fieldwork, which spanned city history, urban design, food deserts, public art and color theory, and transportation access. Camden Miller, a PhD student in urban planning and lead teacher for the camp, helps a camper add color to the little library. 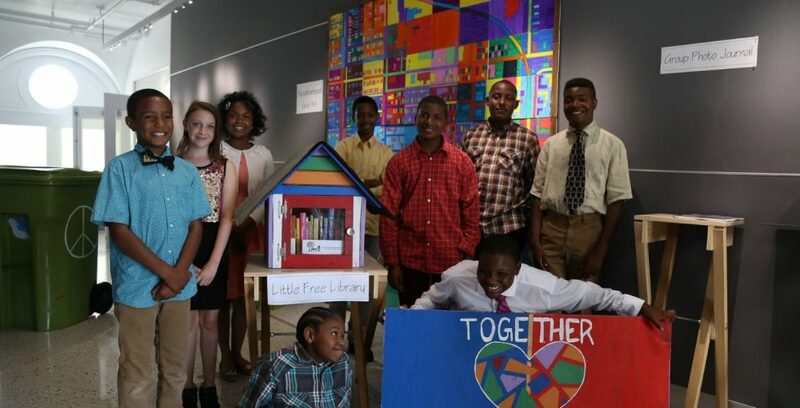 Campers repurposed a plywood palette into a "little library" for installation in the Fruit Belt neighborhood. The colorful trade library creates a sense of place while addressing challenges in access to books for neighborhood youth. 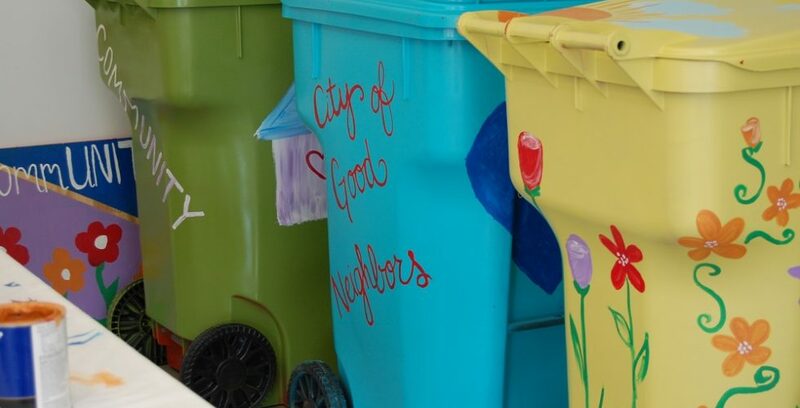 Students painted donated garbage totes as a colorful solution to litter in the community. Campers adorned stepping stones with their aspirations for the future of the Fruit Belt neighborhood. The stones will guide visitors through the neighborhood's community garden. 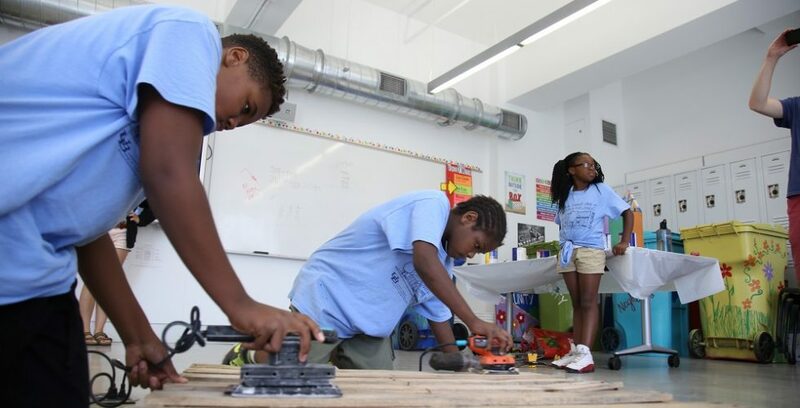 Henry Louis Taylor, Jr., director of the Center for Urban Studies, developed the summer camp, now in its fifth year, to empower Buffalo youth with tools in urban planning for the improvement of their own communities. Beaming participants in the Center for Urban Studies Summer Academic Camp on Neighborhood Development stand with their final projects, presented to the public at the end of the program. 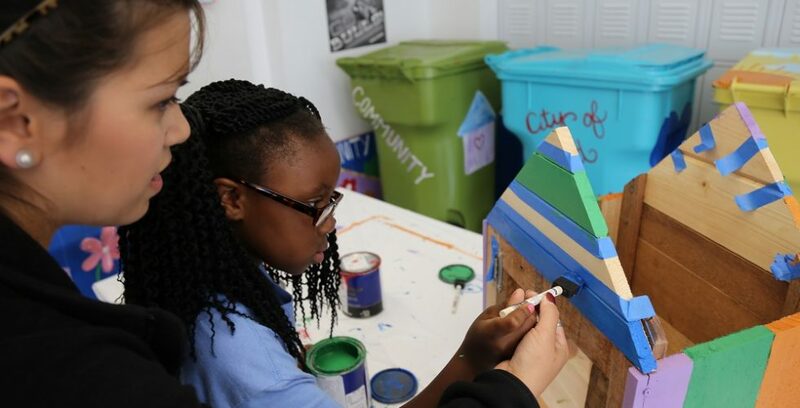 Students took everyday items – plywood palettes and garbage totes – and turned them into neighborhood beatification projects for their own communities through a Center for Urban Studies summer camp program. 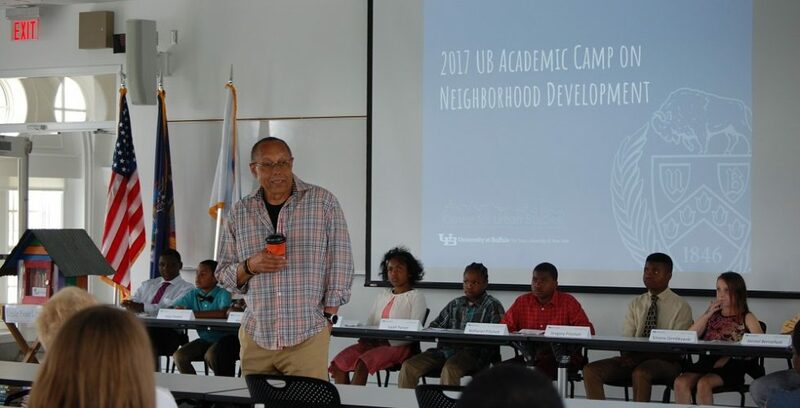 The 2017 program marks the fifth year for the Center for Urban Studies annual Summer Academic Camp on Neighborhood Development, a project-based learning program that empowers Buffalo youth with tools in urban planning for the improvement of their own communities. Topics covered include placemaking, the history of Buffalo, public art, food deserts, vacancy and “complete streets,” or safe access to streets for all users. Targeting middle-school-aged youth, the program is based on the premise that learning is enhanced and motivation is increased when skill development is linked to real-world projects that positively change communities. This year, students took their plans and ideas from concept to action, creating five projects designed to address specific challenges in communities on Buffalo’s East Side, from the Fruit Belt to the Martin Luther King Jr. Park neighborhood. One group of students, bothered by the prevalence of litter and trash in the neighborhood, proposed a creative solution to the City of Buffalo that would combine an increased presence of trash receptacles with public art. Students were able to obtain six garbage totes from the city which they then plastered with paint and colorful patterns and designs. The Fruit Belt neighborhood is a more colorful place thanks to the work of these students. A rusty chain-link fence around the Futures Academy community garden is now covered by a painted mural, a project informed by lessons in color theory and the effects of color on mood. 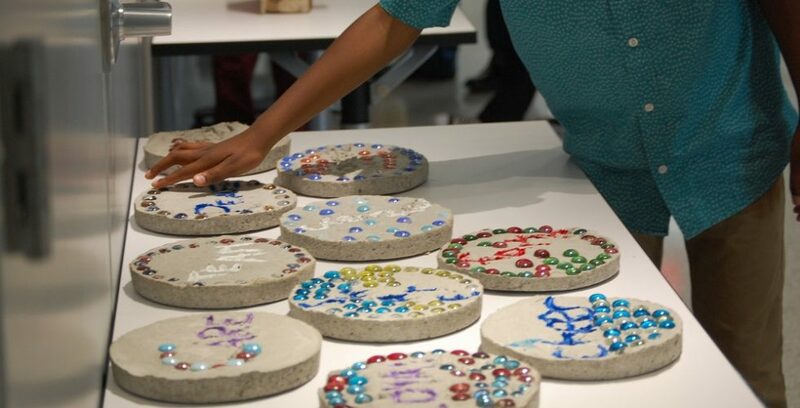 Leading visitors through the garden is series of stepping stones, each painted with the students’ aspirations for their future neighborhood. That project was based on fieldwork in the community. Just beyond the borders of the garden is a “little library” constructed with a repurposed palette – and adorned with the colorful imagination of these campers. This entry was posted in Uncategorized on December 18, 2017 by nrm7.